Announcing the thirty fourth annual SJAA Auction! This year, it will be held on Sunday, 16 March 2014. The bidding starts at noon; specific times are below. If you are interested in picking up some used astronomy gear, this is the event for you. Likewise, if you have astronomy gear that you no longer use or want, this is a good way to find it a new home. Volunteers have developed an online pre-registration form that sellers can use to expedite their registration on the day of the event. Get to it by clicking here: the Auction page. Note there will be at least one break in the bidding. As in the past, this is a full on auction. So the following rules and guidelines will apply. – Buyers and sellers must stay to end of auction, no cashing out until then. – This is a cash or check -only event; no credit/debit cards. – For sellers, you can have a reserve price, but consider an opening bid amount, otherwise, opening bid will most likely be $1. – There will be a separate form for a detailed item description to be used by the auctioneer. Updated information will be made available on the auction page at the sjaa.net website. Cosmos: Spacetime Odyssey premieres Sunday March 9th !! Called the successor to Sagan’s Cosmos – Neil Degrasse Tyson’s Comos: Spacetime Odyssey premieres Sunday March 9th. Also – all 13 of the original episodes, which for ten years remained the most widely watched series in PBS history, will be rebroadcast this weekend. The National Geographic Channel will run a marathon from 12pm to 6pm on Saturday, March 8, and from 12pm to 7pm Sunday. That will leave devotees enough time to tuck in dinner before the new show airs at 9pm. Astronomy theme and local-arts play – what could be better? COMET ISON – VIEW IT NOW! The RASC Observer Handbooks Are Here! 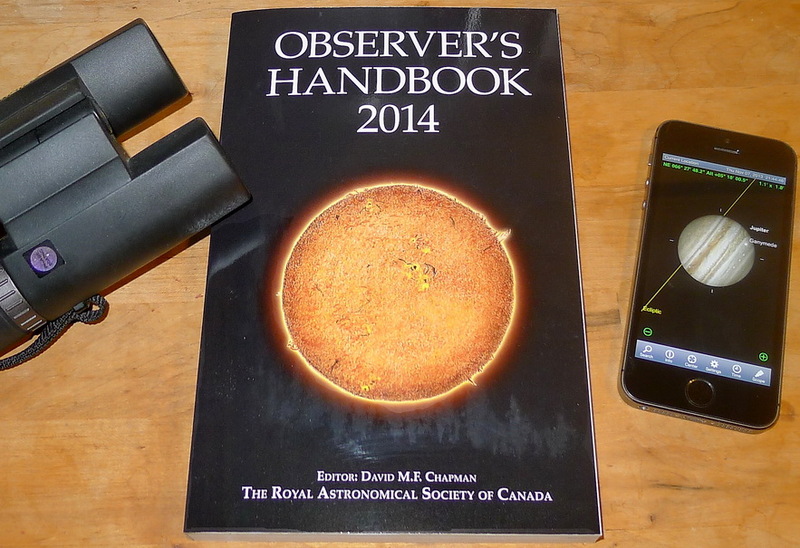 The 2014 Royal Astronomical Society of Canada Observers Handbook is the best annual astronomy resource in print. Even In today’s tech world, amateur astronomers make the most out of any night in the field with just this book, a basic astronomy app and the optics of their choice. Superb articles for 2014 by noted Authors such as David Levy (Amateur Astronomer and Author), Fred Espenak (NASA), Syuichi Nakano (Sumoto Japan, 2014 comets) and “our” Derek Briet (Morgan Hill CA on Planetary Occultations). Heads up to all volunteers, sun worshipers and outreach/communication specialists! The San Jose Astronomical Association will again, for the fourth year in a row, bring astronomy and science directly to the people. On Sunday, 25 August 2013, I and a few volunteers will be at the Camden Community Center in San Jose, not far from SJAA basecamp, Houge Park from 11AM to 4PM. We will have the SJAA’s 100mm h-alpha scope set up, as well as a few others, including an SCT with a white light filter, and we’ll use those to provide views of the sun to passers by while chatting them up about the SJAA and all things astronomy. If you would like to participate, please contact Rob Jaworski at rob.jaworski at sjaa.net. There are no requirements, no prerequisites, no restrictions. Just let us know so we can expecct you! SJAA is proud to announce a new benefit for it’s members. We are now providing a listing service to assist you in selling your astro gear. All you have to do is provide me with a picture (or pictures) of the item, a description (a lot of detail is best), a price you are asking, the terms of the sale (cash only, etc), and how you wish to be contacted. We will then post this information up on our Member For Sale Listing page (link on the right side of this page). Please notify me should you want to make changes or remove the item. And don’t forget to check out the items the club is selling via the links on the right. We’re at the start of another cycle around the sun, and this is a good point in time (and space) to look back over the past cycle to see what’s been going on with the San Jose Astronomical Association. The Quick STARt program (the former Mentoring Program) helps to ease folks into amateur astronomy. You have to admit, astronomy can look exciting from the outside, but once you scratch the surface, it can get seemingly complex in a hurry. But it doesn’t have to be that way if there’s someone to guide you and answer all your seemingly basic questions. The Quick STARt program really took off in 2012 with the leadership and energy of Dave Ittner. He has already helped dozens and dozens of people get their feet wet in getting out under dark skies to discover what’s out there, firsthand. Over the year, Dave has also refined the program , adding not only easy to use Dobsonian telescopes but all the accessories any good observer needs, such as observing chairs, appropriate eyepieces, sky atlases, accessory cases, etc. The Quick STARt program is available to SJAA members, and you can find more information, including how to contact Dave to sign up, here. A program that is entirely new for 2012 was the Fix It session, sometimes called the Tune Up or the Telescope Fix It program. This is a real simple service the SJAA offers to members of the community, though it’s priceless. The Fix It session provides a place for people to come with their telescope or other astronomy gear problems. Every first Sunday of the month, from 2 to 4PM (coinciding with the Solar Observing sessions), several SJAA members make themselves available at Houge Park for people to come with their scopes to get help with their gear. It can be any type of issue, such as broken scopes whose owners need advice, help with collimation, or even a quick session on how to use it. Weather doesn’t slow this program down, so even if it’s windy, cold and rainy outside, Fix It day goes on. Big thanks to go Ed Wong and Phil Chambers for being the gear experts who faithfully make themselves available at Fix It day! Another new program that debuted in 2012 is the Astro Imaging Special Interest Group (SIG). This was spearheaded by Harsh Kaushikkar and has a mission of bringing together people who have an interest in astronomy imaging, or put more simply, taking pictures of the night sky. The Imaging SIG meets roughly every other month at Houge Park to discuss topics about imaging, as well as in the field, usually at Rancho Cañada del Oro (more on that site later). The SIG is open to people with absolutely no experience but want to learn what it’s all about, but experienced imagers are also more than welcome, indeed, encouraged to participate. The best way to get involved is to review the postings on the SJAA AstroImaging mail list in Google Groups. Here’s the link. The SJAA has been working with the Santa Clara County Open Space Authority (sometimes called simply the OSA) to make one of their sites available to astronomers. The OSA’s Rancho Cañada del Oro (sometimes called RCDO, or Rancho) site is made available more and more with the dedicated work of SJAA members Chris Kelly and Dave Ittner. Both are also docents with the OSA, which really makes the partnership between the two organizations that much more cohesive. If you are interested in experiencing a fairly dark site that’s not too far from home, consider coming out to Rancho when it’s announced it will be open. Located just south of Calero County Park, between San Jose and Morgan Hill, Rancho gets surprisingly dark for being so close to an urban area. Keep an eye out on the SJAA Announce mail list for notifications of when it will be available. There were many more accomplishments during the year for the SJAA, and this post could go on and on about them. But before we get too long winded, let me make a few, more brief acknowledgments. SJAA members gathered to view the Venus Transit, the annular eclipse, and the last shuttle flyby. The SJAA again participated in two community events, the Cambrian Festival and the Almaden Art and Wine Festival. The City of San Jose provided a grant of $500 to the SJAA to help offset the cost of insurance for the school star party program. Jim Van Nuland continues to be the heart and soul of the school star party program. The telescope loaner program was revamped, with its inventory cleaned up. And the auction was a success, in which the club divested itself of many older scopes from the loaner program bringing in some much needed funds to help with the revamp of the loaner program. The general meetings now have a social time beforehand, allowing members to mingle. The SJAA produced a video of one of the monthly talks, which was broadcast on cable TV. The website was overhauled, and looking great. The club newsletter continues to be consistently produced every month, in large part due to Paul Kohlmiller’s effort, and the montly column my Akkana Peck. And membership has increased by 10%! There is more, indeed, but these many items are the highlights. The board and the active volunteers have plans to make 2013 just as active, lively and fun. I hope that if you haven’t been getting involved, you will consider doing it soon! Come to Houge Park, or contact any of the board members to participate! SJAA has accumulated a lot of scopes and accessories over the years. We now have too many items and too little room so it’s time to offer them up for sale. I found it best to break them out into one of three categories – Telescopes, Eyepieces, or Misc Items and put them on their own separate page here on this blog. The links to these pages can be found to the right of this post. These items are offered up as is and on a first come first serve basis. Should an item not yet be priced it will be shown as $TBD. Feel free to offer a price for us to review and then either accept or counter. I would be glad to answer any questions you have and or show you the item of interest by setting up a time to meet at Houge Park. Please check back periodically as we have many more items to list (will be added to the bottom of each post). Climate Change: What’s Going On With the Sun? Throughout the past century, while greenhouse gas (GHG) abundances have been steadily increasing and influencing Earth’s climate, the Sun has remained relatively bright and quiescent. Solar cycles have been steadily active, with instantaneous sunspot numbers at solar maximum exceeding 100 in every cycle since 1893 (Cycle 13). The climate warming we have experienced since the beginning of the modern industrial era cannot be attributed to the Sun. However, the recent minimum between Cycles 23 and 24, and NASA predictions of a substantially lower sunspot number at the 2013 solar maximum, suggest that the Sun’s recent bright and quiescent period may be ending. Both autocorrelation studies of recent solar cycles, and studies of solar analogs in nearby field stars, suggest a >40% chance of the Sun entering a new Maunder Minimum sometime in the Twenty First Century. During the historical Maunder Minimum (1645-1715), meteorological data from Europe and proxy records from global oceans indicate a substantially cooler climate, attributable to decreased solar irradiance. In our lifetime, we may therefore see a period of solar dimming in conjunction with increasing GHG abundances. A new Maunder Minimum would not entirely offset the projected GHG-induced warming (the GHG radiative forcing is at least three times larger than best estimates of the solar irradiance decrease). Instead, the complex interactions between radiative balance and atmospheric dynamics yield unusual regional patterns of pronounced warming versus cooling. This seminar will address the physical basis of climate change in the context of both GHG and solar variability, and will also extend the discussion to the influence of stellar variability upon habitable zones. Visible Sunspots over next couple of days! Over next couple of days one will still need good eyes and a good solar filter to see these (and welding glass wont cut it). Solar glasses are good, Solar Cards better. Malika Carter: Sunspot image with her eyepiece projection system. Click photo to enlarge. For those of you who have H-alpha scopes: Good prominences at limb particularly at ~5 O’clock refactor view – prominence drapes over the photosphere creating a sinuous filament. There’s been a nice 1X power sunspot group visible the last coupe days. It doesn’t look quite round and that’s because there are indeed two large spots in proximity. Below this (scope view) there is a chance to see a new sunspot group still forming. Yesterday the 5 sunspot specs were darkening – today they’re more obvious. All this should prove good viewing tomorrow. BTW Excellent h-flares south of that. One, a broken toroide or slinky, arcing several degrees along the sun’s limb. 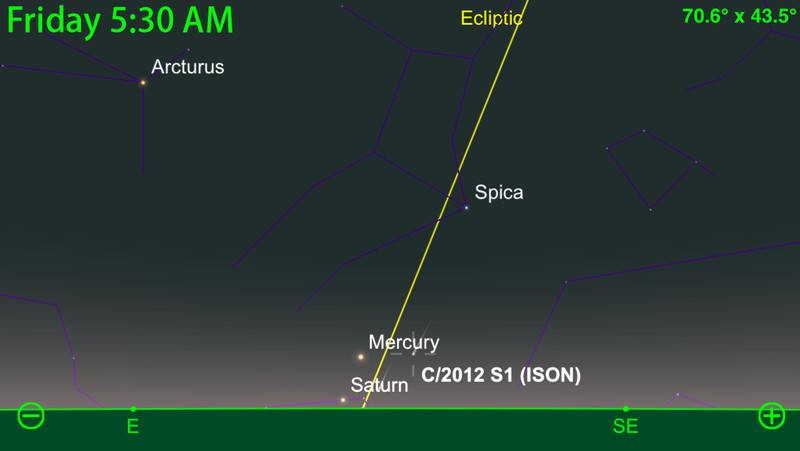 This is our welcome blog post, from the San Jose Astronomical Association. We have our various email lists and website, but I thought we were still missing some vital components to a true Web 2.0 presence for the club. Here, you can subscribe to this blog where I plan to post write ups about some of our events, such as our public star parties, beginner astronomy classes and speaker events. You can keep track of upcoming events, too. Please feel free to post comments and suggestions. We are really interested in hearing what our membership thinks where the club should be going, what it should be focusing on, and this could be a very good way to start and continue the conversation! Look forward to posting more here soon. In the meantime, clear skies, and I’ll see you in the dark!